Image caption Those at risk of heart attacks can be treated before the event happens, researchers say. Scientists have developed a new way of scanning the heart that could predict who will have a heart attack. It has the potential to revolutionise treatment for one of the biggest killers in the world, says the team at the University of Oxford. It works by analysing the fat and inflammation around arteries to see which are a ticking time bomb. And it could allow high-risk patients to be given more intensive treatment to avoid a heart attack or stroke. The researchers were looking at the role of inflammation in heart disease. Inflammation is that red, swollen and sore feeling you get after a cut - but the same process plays out in all the tissues in the body. On the inside of your blood vessels, inflammation is linked to the build-up of unstable plaques. These can break apart, block a coronary artery and starve the heart of oxygen - namely a heart attack. "The holy grail in cardiology is the ability to pick up inflammation in coronary arteries, it's been a challenge for the past 50 years," said Prof Charalambos Antoniades, one of the researchers. The study, published in Science Translational Medicine, shows inflammation changes the behaviour of fat around the outside of blood vessels. When there is inflammation, the fat starts to break down and the surrounding tissue becomes more watery. This can be picked up by analysing CT scans, which are already a part of heart health exams. The redder the tissue appears, the greater the level of inflammation and the greater danger. This study is just the appetizer - it showed the changes can be detected in people who are already having cardiac surgery. The main course should arrive by the end of the year. The team is going over 2,000 heart scans to see how good their method is at predicting heart attacks in people who appear healthy. 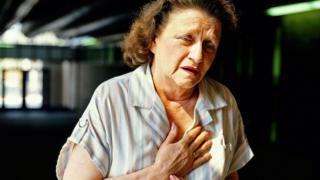 Prof Antoniades told the BBC News website: "This technology may predict who will have a heart attack in the future. "It means you could go to your GP, change your prescription and prevent it before it happens." For example, it could show somebody who appears healthy is in the early stages of heart disease and needs cholesterol-lowering statins. Or somebody could be at seriously high risk and needs more drastic interventions. Prof Metin Avkiran, associate medical director at the British Heart Foundation, said: "Discovering which plaques are likely to rupture, so people can be treated before such a devastating event strikes, is a major objective of current research. "If the technique lives up to its promise in larger trials in patients, it could lead to more effective treatment to avoid a potentially fatal heart attack or stroke."